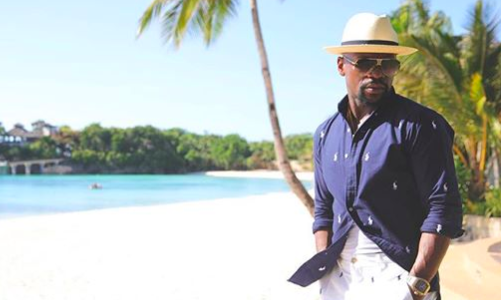 Floyd Mayweather Jr. is being Floyd Mayweather Jr while being in the Philippines. No, he’s not there to announce his ring return by finalizing a rematch with Manny Pacquiao. He’s in the Asian nation just to enjoy a vacation. And, the 50-0 boxer is doing everything that is expected out of him… well, almost. Mayweather took to his official Instagram account to share a glimpses with his 23.2 million followers. “In the Philippines, playing beach volleyball with my pilots,” he captioned a shirt-less photo of himself playing beach volleyball with his pals. Y’all muthafukas got the drip – but I’m the ocean. In the Philippines, playing beach volleyball with my pilots. Besides, he also posted a story, wherein he can be seen counting heaps of cash at a casino. Meanwhile, Mayweather hasn’t fought since stopping UFC star Conor McGregor in August 27. Even as he’s announced retirement since, the 41-year-old came out to demolish kickboxer Tenshin Nasukawa in an exhibition game.